American Tourister Wakefield 62246 is a budget-priced luggage set of five pieces- three suitcases (19, 24 and 28 inches), a garment sleeve and a boarding bag. You have three color choices of black, teal blue and purple to choose from with no price differences at the time of this review. If you’d like the advantage of being able to pick your bag easily among a crowd of bags then you may go for one of the non-black colors that will stand out on the airport carousel. 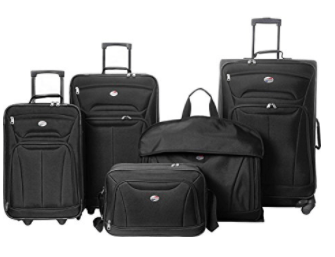 This is a soft-shell luggage set with the rugged, sturdy and durable 600D polyester material used on the outside and fully lined interior for additional security. Shipping weight for the whole thing is 25.31 pounds and measures 10 x 28 x 18 inches, which is also the exact size of the large 28” suitcase. You will get the bags fitted inside each other, basically all inside the largest 28-inch suitcase. 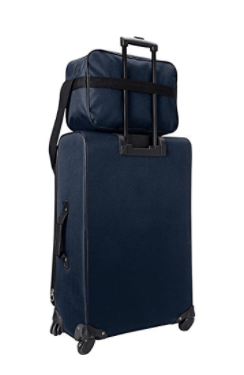 The three upright suitcases come with handles on the side and the top, as well as the telescoping, handles with push buttons that lock at two points. The largest one has the spinner wheels that rotate in all directions for easy mobility at the airport terminal, parking or hotel. There is a mesh pocket inside each suitcase’s front panel and the tie down straps on the other side to help keep your clothes in place. It is also good to have the two zip pockets for your items that you want to access easily on the outside at the front. Zippers seem to be good quality and durable. The garment sleeve unfolds to 40 inches and includes a sleeve section inside that gives space for a total of four hangers and also has an exterior pocket. It is nice to have the flexibility of choosing from bags of different sizes for your shorter or longer trips. You can use the 19” and the boarding bag as carry-on bags to take with you on the plane and put in the overhead locker above your seat. And some airlines may let you use the 24-inch suitcase as cabin luggage too. But you will always need to check in the large 28-inch suitcase and sometimes the medium 24” bag. The biggest 28” suitcase measures 28 x 18 x 10 inches, 24” medium upright 24 x 16 x 8 inches, 19” upright is 19 x 12.5 x 7 inches, the boarding bag is 10 x 15 x 6 inches and the garment sleeve measures 22 x 41 inches. As a backup of its build quality, the company offers ten years of warranty for the American Tourister Wakefield luggage set, which should give you a peace of mind. But we can’t really see how a five-piece luggage set that is priced around hundred dollars can be that durable and last ten years if used frequently. We recommend this set for those that travel occasionally rather than all the time for their jobs. This is a good value for money set overall and we recommend it more to those on a budget.